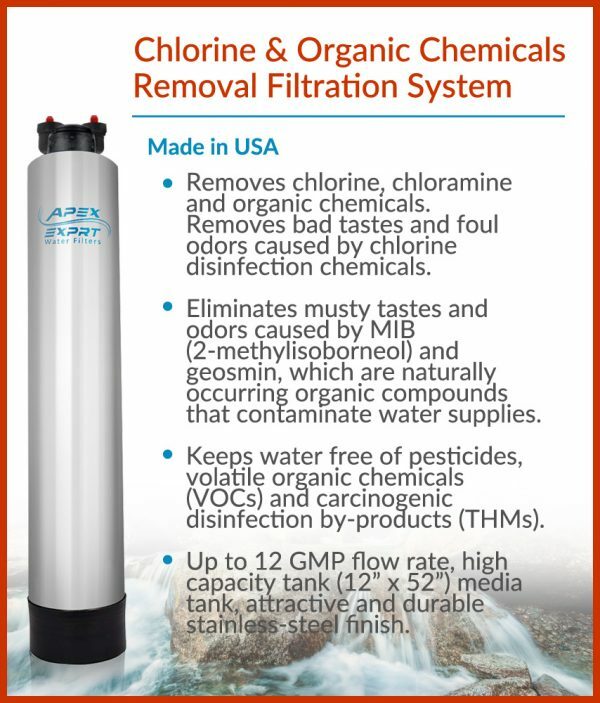 Removes bad tastes and foul odors caused by chlorine disinfection chemicals. Eliminates musty tastes and odors caused by MIB (2-methylisoborneol) and geosmin, which are naturally occurring organic compounds that contaminate water supplies. 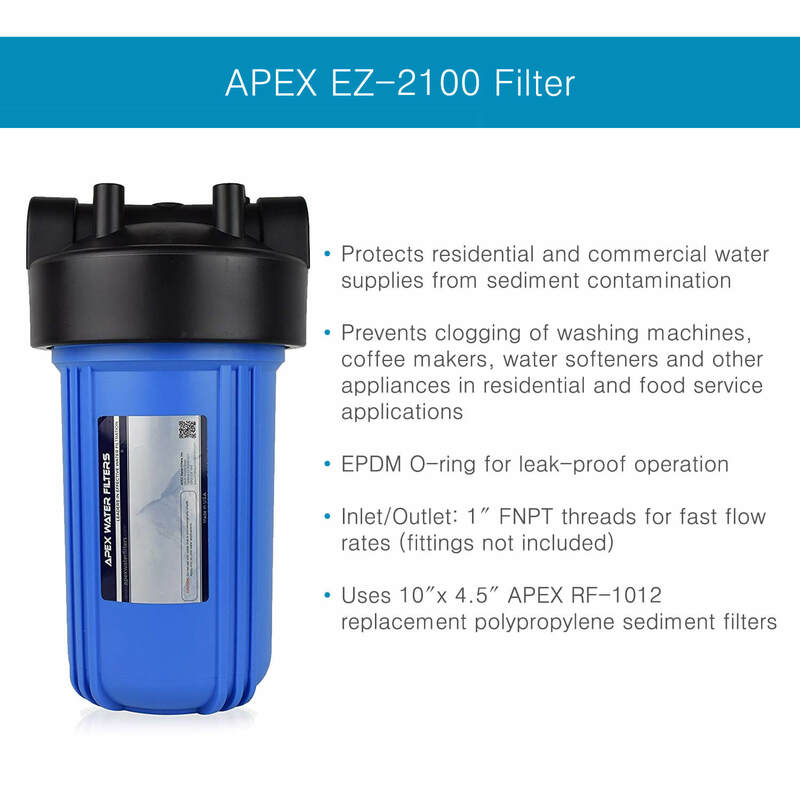 The APEX Whole Home Filter System uses catalytic carbon and KDF 85 Process Medium to adsorb impurities from well and municipal water sources. High active carbon has a unique microscopic pore structure that adsorbs chlorine disinfectants, which cause offensive tastes and odor problems in tap water. 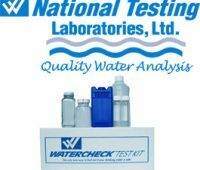 The chlorine disinfection process also leaves cancer-causing organic byproducts, called trihalomethanes (THMs), in your drinking water. 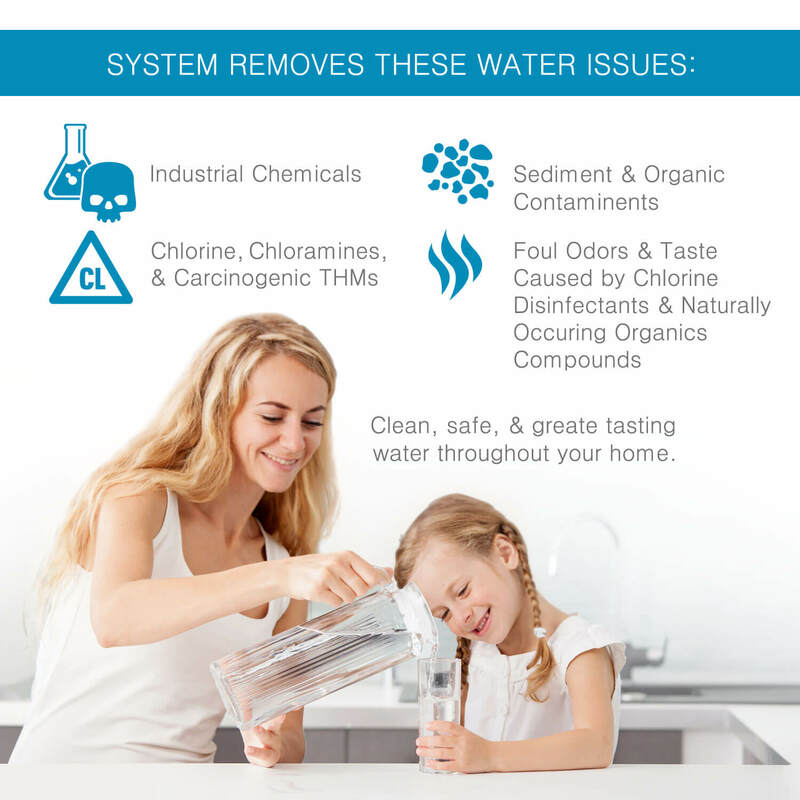 The Whole Home Filter System strips carcinogenic THMs from tap water, protecting you, your family and pets. 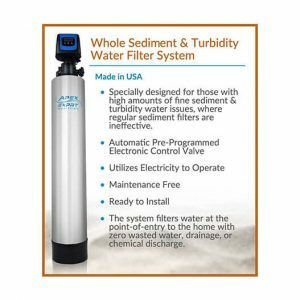 The filter also removes organic contaminants like chloramine, herbicides, insecticides and industrial chemicals that can contaminate groundwater. Naturally occurring organics (geosmin and 2-methylisoborneol) as well as iron (ferrous) and hydrogen sulfide (H2S) which cause musty, earthy odors, are also adsorbed by the APEX filter system. 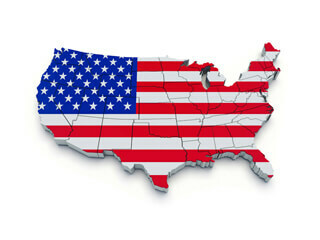 Accidental gasoline spills, chemical contamination and industrial leaks containing volatile organic compounds (VOCs) can be a threat to your familys health. 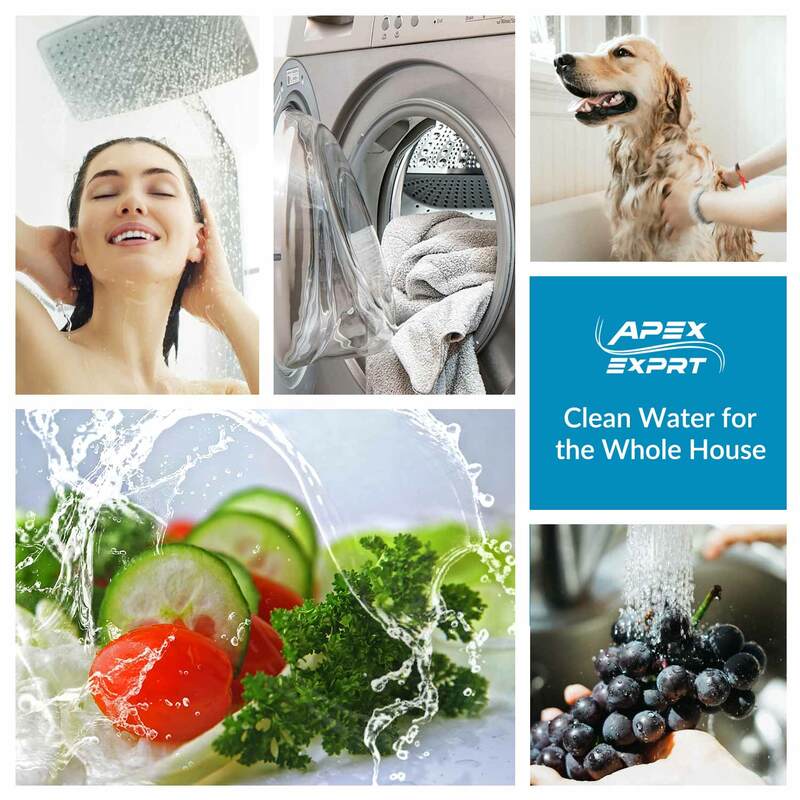 The APEX filter provides real protection and peace of mind for you and your family. Even pets will appreciate drinking and bathing water free of chlorine and other tastes and odors. 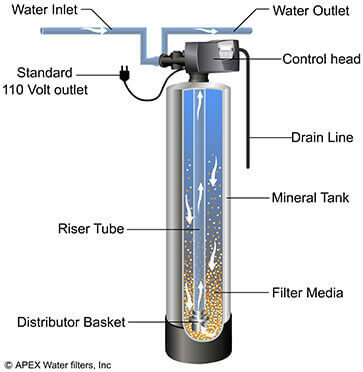 The APEX Filter System is suitable for home and commercial water filtration needs. 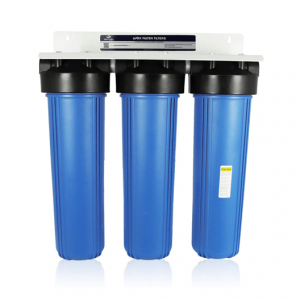 The large capacity and high flow rate makes the Whole Home Filter System ideal for whole house applications as well as apartment complexes, offices and restaurants. Chlorine and other taste and odor contaminants affect ice machines, beverage dispensers, coffee makers and other food preparation operations. 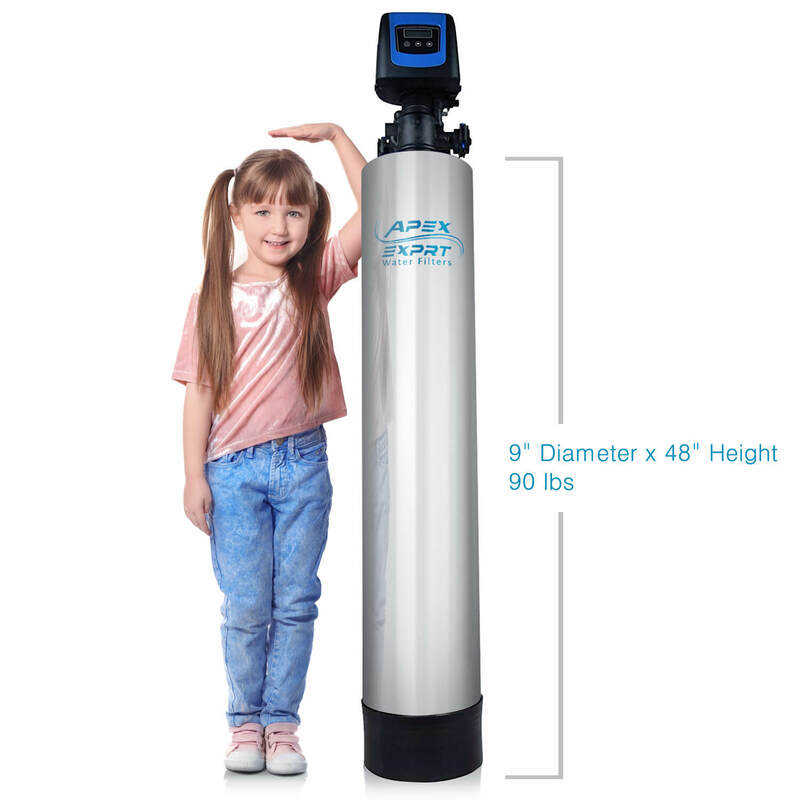 The Filter System is also recommended for dental offices, sensitive laboratory equipment and manufacturing facilities where purified water is essential. 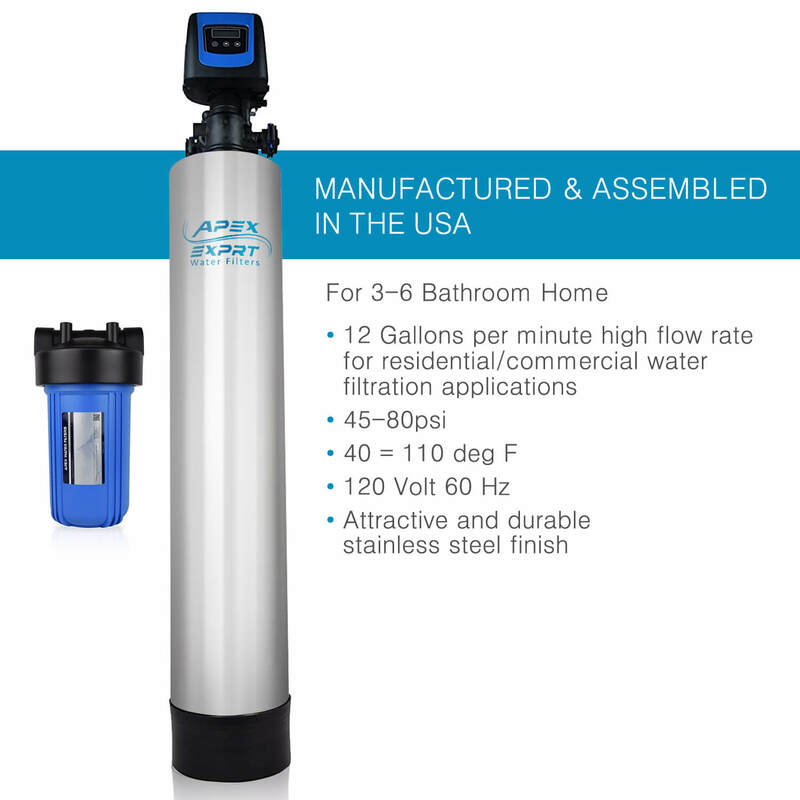 The APEX Whole Home Filter System is assembled and tested in our US facility. 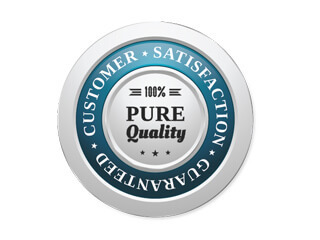 We use only high-quality hardware and premium filtration media in our filtration systems. 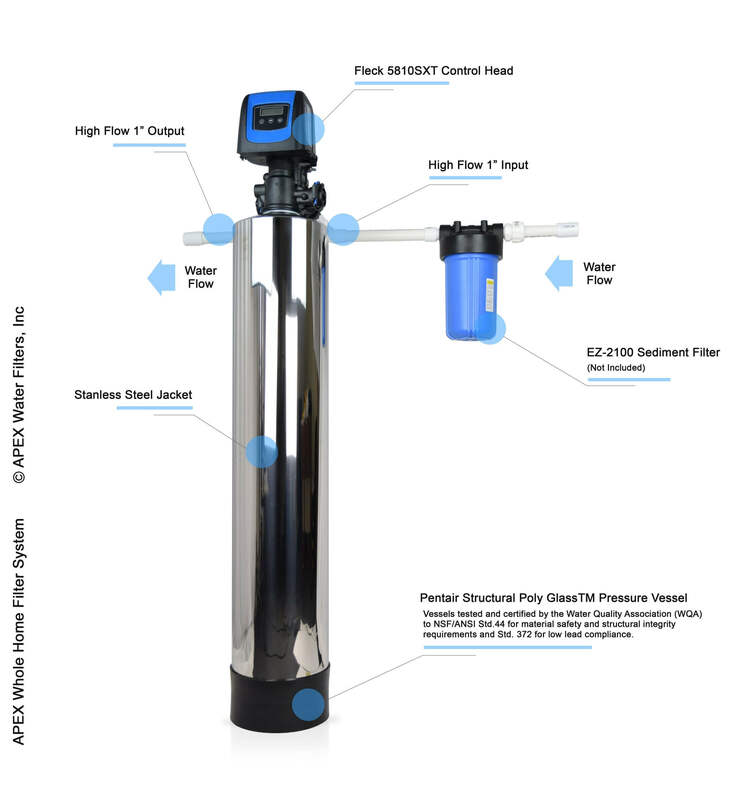 Filter uses a Fleck electronic control valve. 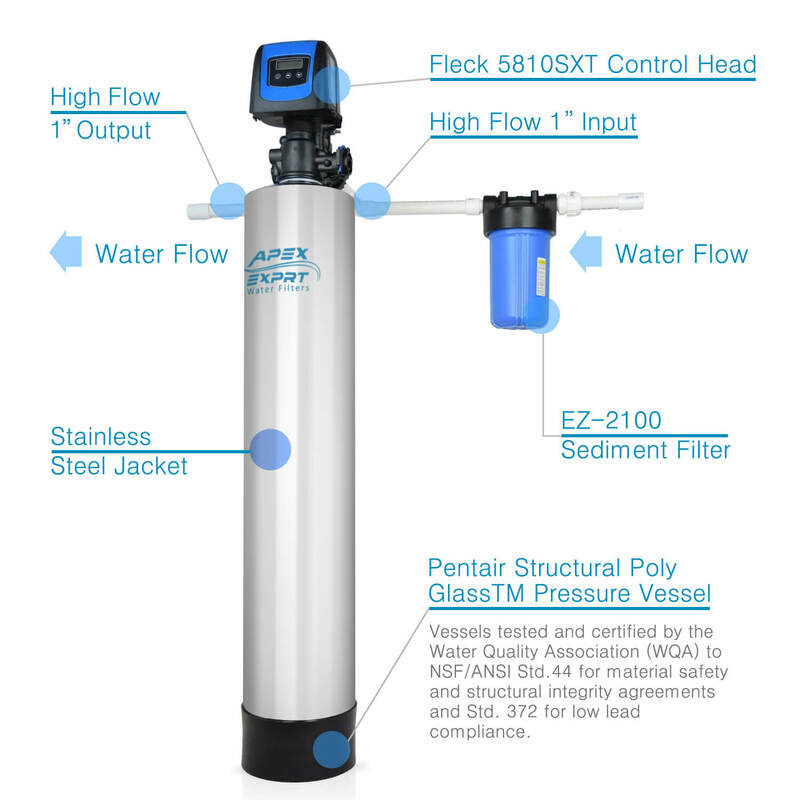 The Fleck electronic control valve automatically monitors and regulates the activity of the filter system. 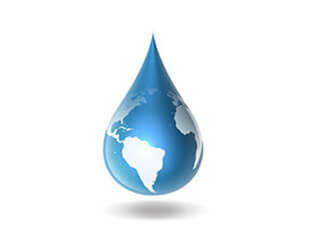 The electronic control valve automatically backwashes the activated carbon based on water usage. This keeps the filter working at peak efficiency. The key pads and digital display make the set-up quick and easy. The Fleck is an industrial-grade control valve that will provide years of trouble-free service in the home, office or business operation. 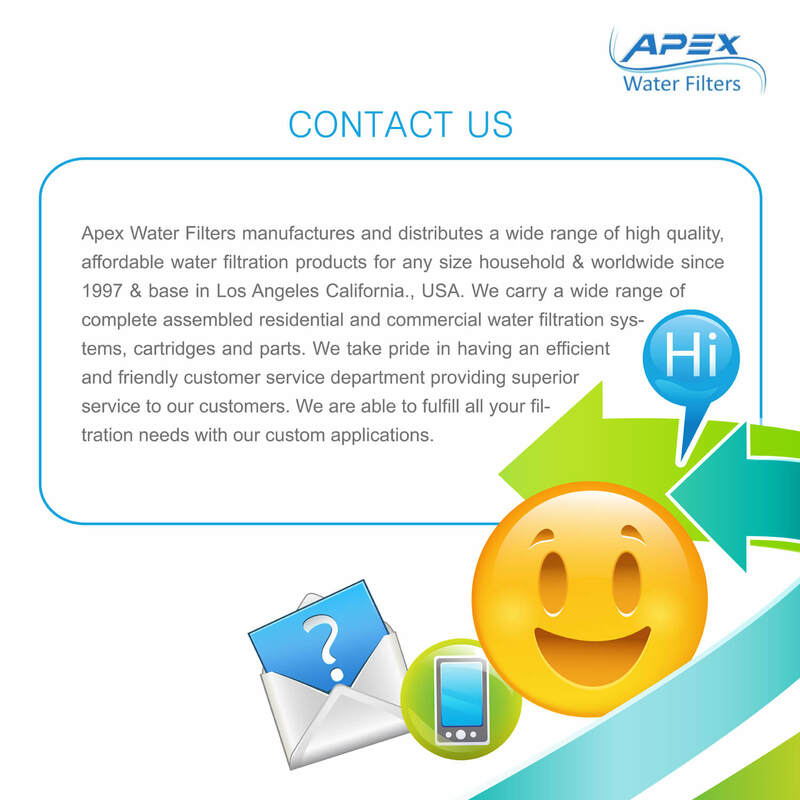 The APEX Filter System uses high-purity granular catalytic carbon and KDF 85 Process Medium suitable for filtering drinking water. ++ Scale prevention measures must be taken.